In between those two slices of bread, you’ll find spinach, micro kale, juicy tomato slices, vegan mozzerella “cheese” and guacamole. This grilled cheese sandwich is packed with fiber, protein, potassium, and good amounts of 5 different vitamins and 13 different minerals! Start by doing your prep work. Wash your spinach leaves, micro kale, and tomato thoroughly. Then set aside 1/2 cup of gently packed spinach leaves and 1/2 cup of micro kale. Cut your tomato into three thick slices. Also cut two slices of vegan almond mozzarella cheese for each side of the bread. Before getting my sandwich all ready, I took one piece of bread and buttered it and put that facedown on the cutting board. It’s pretty hard to butter both outside pieces of the bread while you have this sandwich in your hand so I’ve found if you do that part first, it will make getting the assembled sandwich into the pan a whole lot easier! 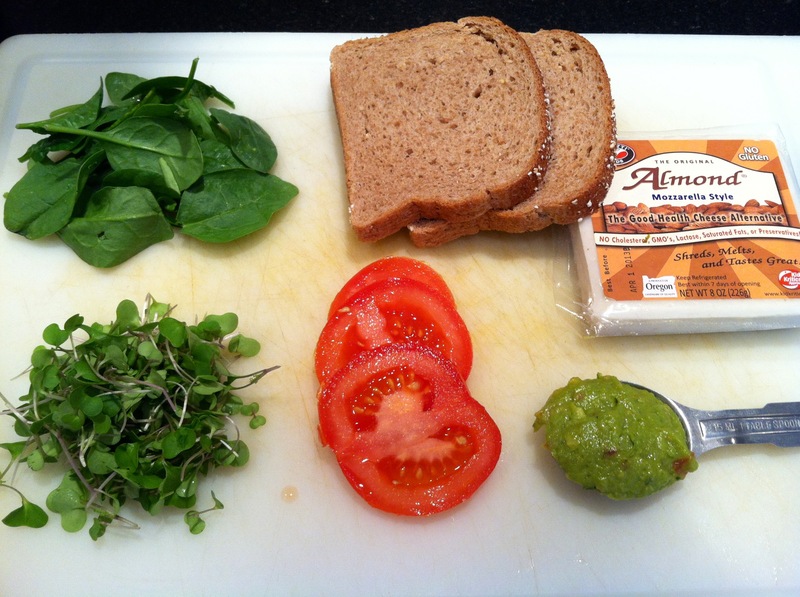 To assemble your sandwich, put 1/2 tablespoon of guacamole on the non-buttered side of bread. Then add your cheese, spinach leaves, micro kale, tomato slices, and more cheese. Take the rest of the guacamole, another 1/2 tablespoon, and spread onto the other slice of bread. 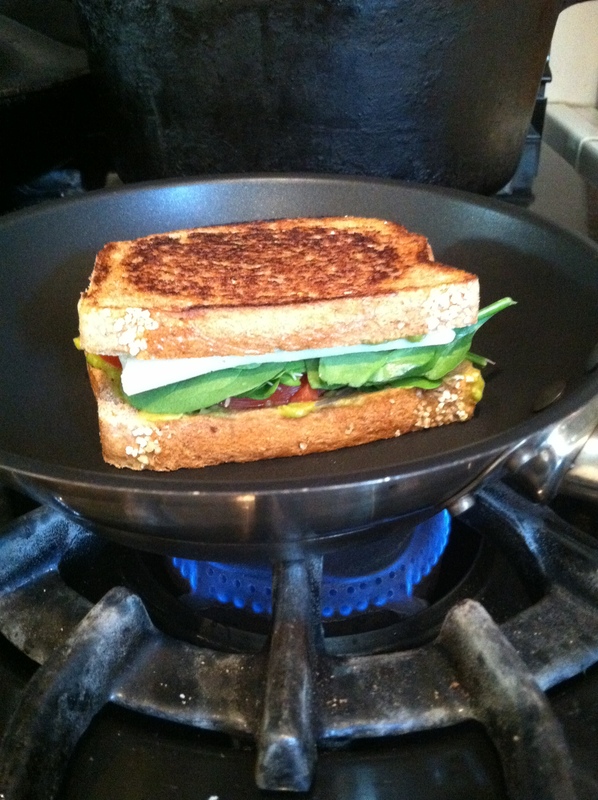 Vegan grilled cheese sandwich ready to be eaten! Put this slice of bread with guacamole side down and gently push down on your sandwich to ensure the sandwich stays all together in one piece. Now while it’s still on the cutting board, I gently buttered the outside of this piece of bread. To get ready to cook up this vegan grilled cheese sandwich, you’ll need to first take your skillet and place it over medium low heat. When the pan is warm, take your sandwich and place it butter side down into your non stick skillet. Let this cook for a couple minutes and the cheese will start to melt. Then flip your sandwich and let it cook on this side for a couple more minutes. 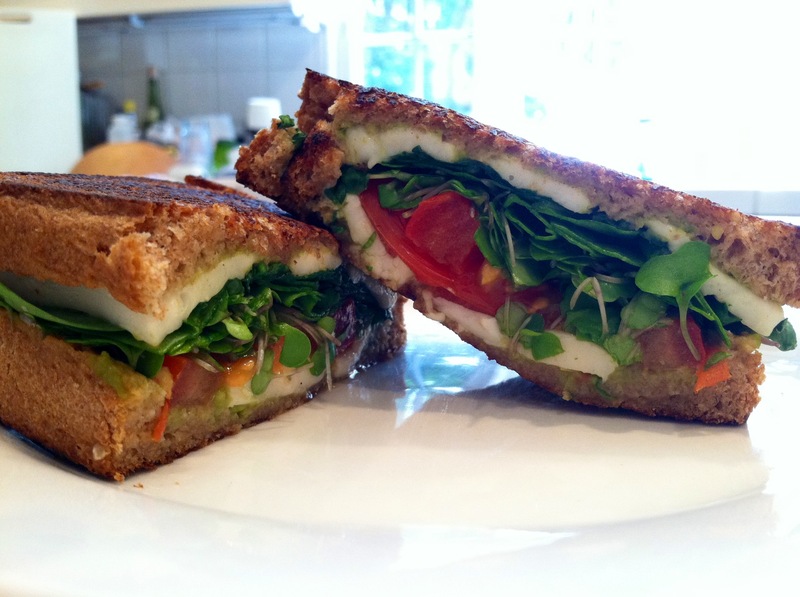 When your bread is nicely browned and your cheese is melted, this sandwich is ready to eat! This vegan grilled cheese sandwich will give you 256 calories, 457 milligrams of potassium and almost 15 grams of protein. It will also give you 34 grams of carbohydrates, almost 8 grams being dietary fiber. In terms of vitamins, you’ll receive 6% of your daily vitamin E, 19% of your daily vitamin B-6, 64% of your daily vitamin C, and over 200% of your daily vitamin A. This sandwich is packed with good amounts of 13 different minerals. Some of those include: 18% of your daily iron, 30% of your daily folate, and 36% of your daily calcium. This looks really tasty and I had never heard of micro kale before today. I hadn’t heard of it either until I saw it at Whole Foods Market. At my store in Los Angeles, there is a whole section next to the produce with all sorts of micro greens like micro arugula, micro basil, micro cilantro and so on. The micro kale I used is from the company Organic America. If you have a Whole Foods near you, you should see if they carry it there as well. I think the micro kale is really great because in addition to being super nutritious like regular kale, it doesn’t have the strong bitter flavor that kale has which makes it more adaptable to different meals. I use Ezekiel bread. Food for Life makes all their breads and they have lots of different options depending on what you’re looking for. They have sprouted breads that are dairy free, egg free, honey free but do have yeast. If you want to avoid yeast, then they also have two different varieties of bread that are yeast free and vegan. If you go on their website, you’ll see all their breads and they have sections laid out for yeast free, sprouted grains and so on. The only thing I’ll mention is that these breads are really dense. I found it took a little while to get use to eating just because of the texture. Hope this helps! Do you which Ezekiel bread? I want to be sure and buy the same as yours. ;) thank you! These are my favorite! 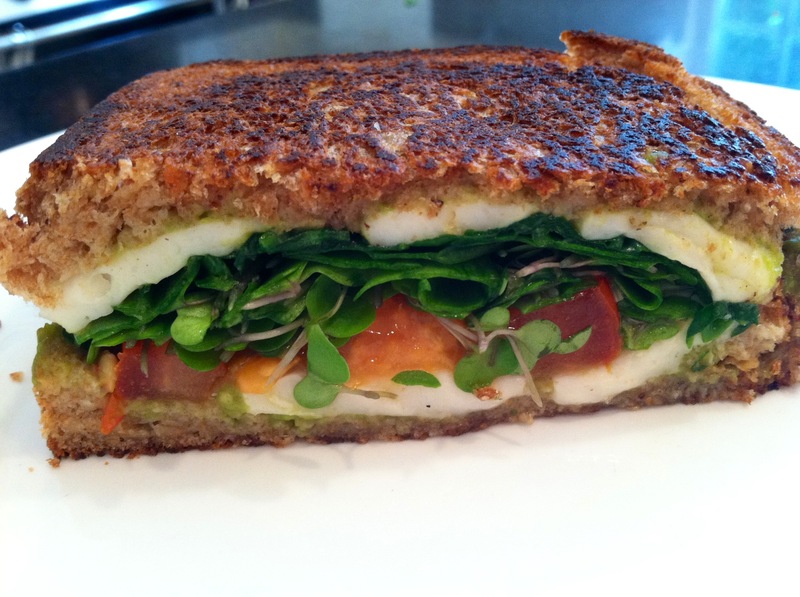 The bread I love and used for this recipe is Ezekiel’s 7 Sprouted Grains bread. All of their breads that I have tried though, I have really loved. Hope this helps! I’m so happy to hear that you both loved this recipe! It is definitely one of my favorites I have posted on my blog. I bet it was quite good with the vegan provolone slices as well! It is very important to look at the ingredients. I’m sorry to hear that you’ve given up on a cheese alternative. I really haven’t found one that I love either though, so I understand completely. I also love Ezekiel bread, so delicious!